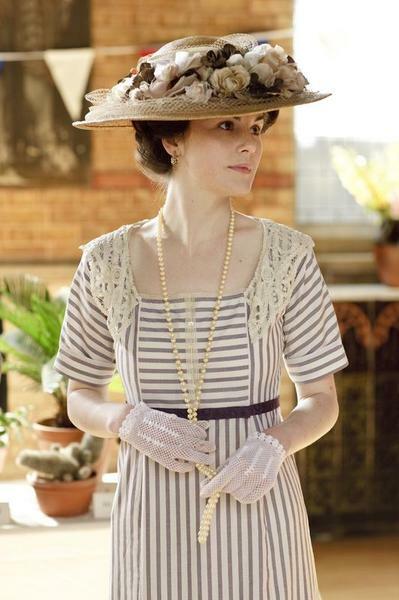 Lady Mary in one of her signature dresses from the Tv-series “Downton Abby”. 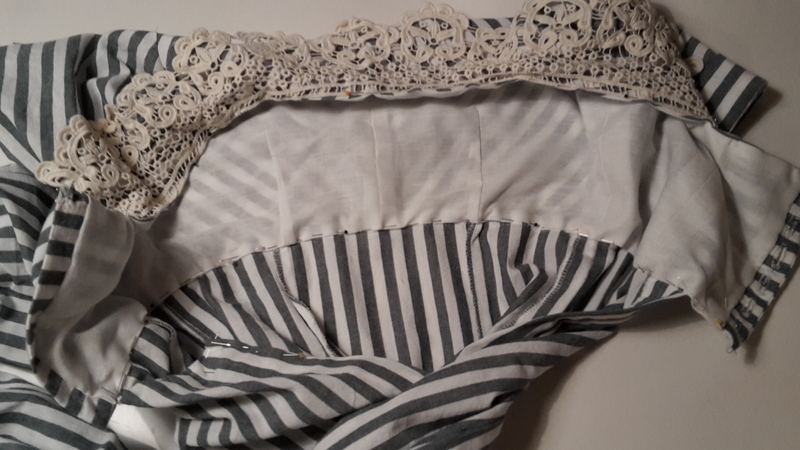 Once the bodice was finished and lined I attached it to the skirt, set the sleeves I once more tried it on to determent the exact placement of the hook and bars for the skirt closure. 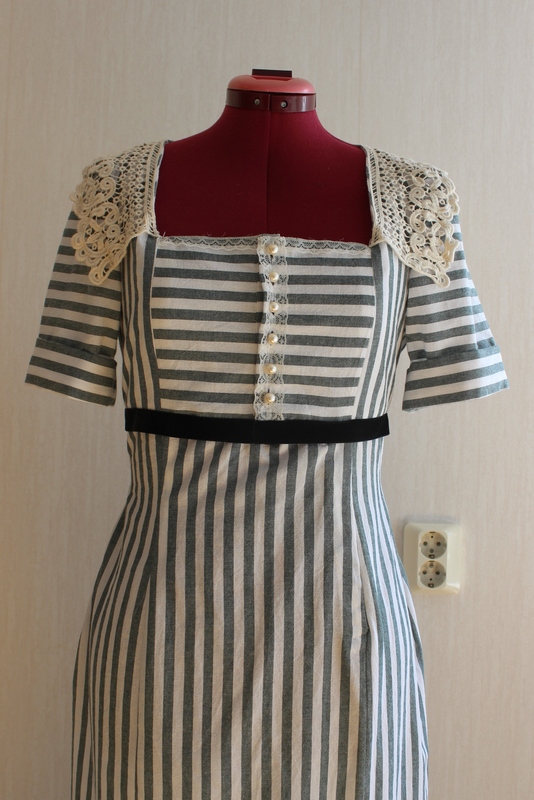 I also pinned on the collar to get a better visual of the completed look. The fit looks good even though it’s more figure hugging and shaped then the one on Lady Mary. 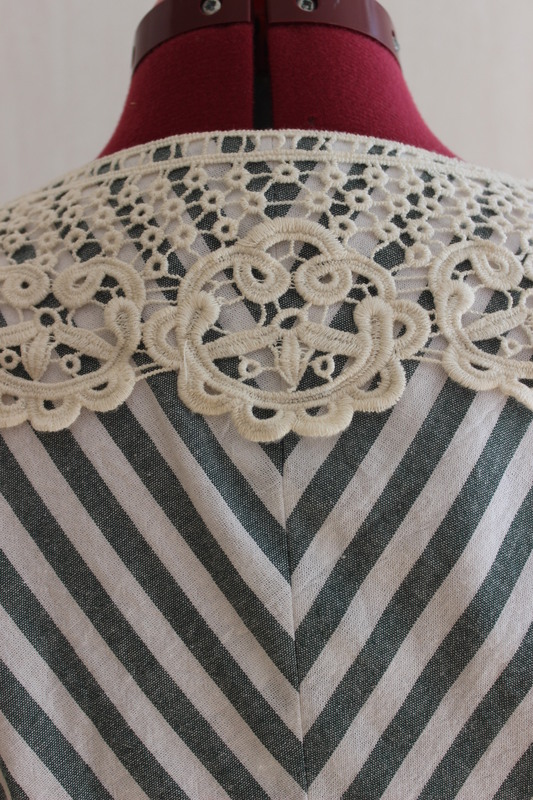 Then I needed to pause the sewing for a few days over the May 1st celebration, so I put it on the dress form to keep me inspired (and to show of to our long distance friends coming over – don’t tell me you never done that…). 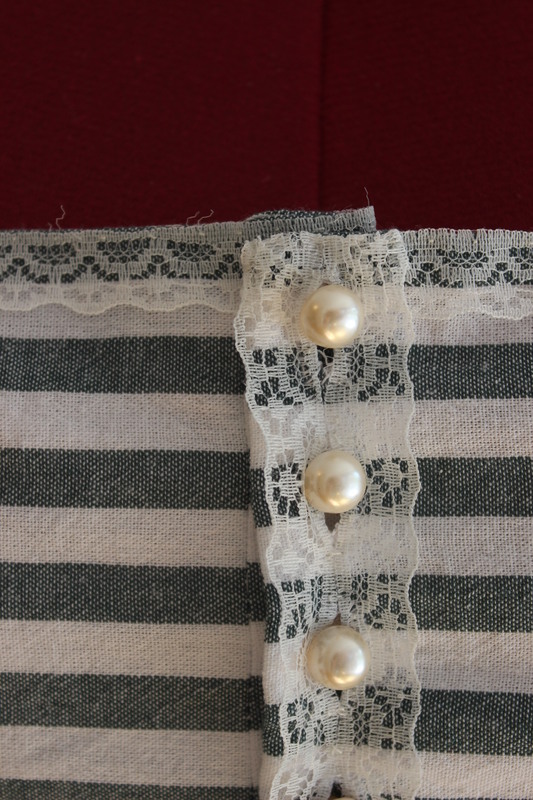 Once back at sewing, I pinned some narrow lace ribbons to the buttonhole stand and top front piece. 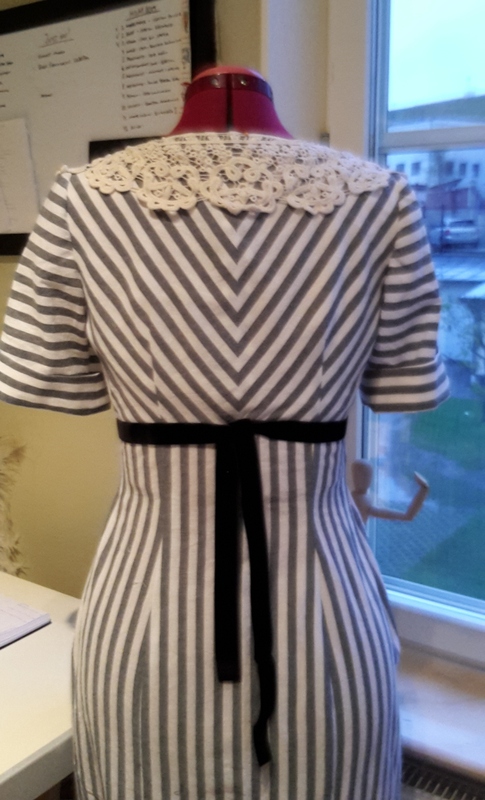 Then I spent a few hours (at my in-laws) hand stitching the narrow lace, the collar, the lining, the black velvet ribbon and the hooks and bars to the bodice. How it fit the challenge: WWI started in summer 2014. 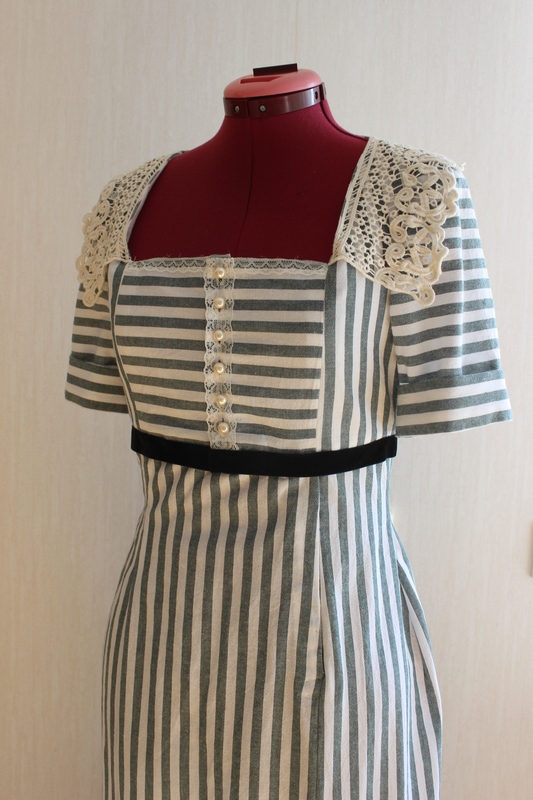 My dress is also a re-creation of the dress Lady Mary Crawley wears in the TV-series “Downton Abby”, in the episodes (and at the garden party) it’s announced that England will join the war. 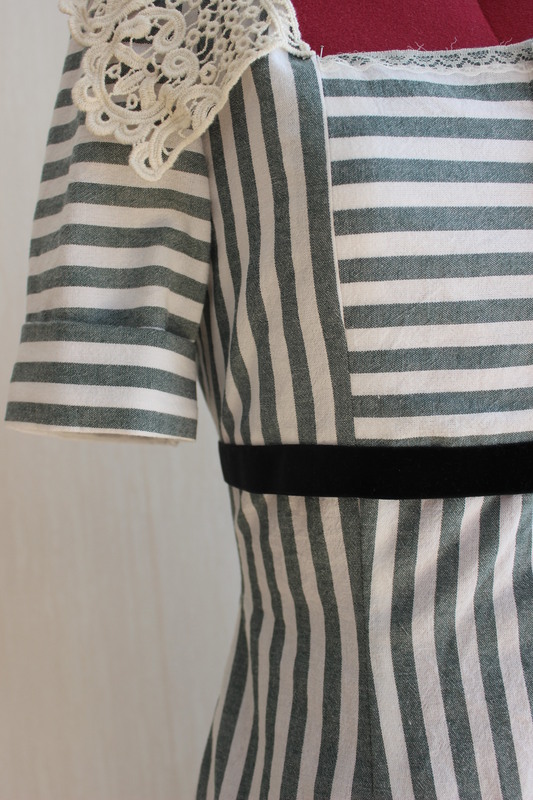 Fabric: 2,5 m of striped cotton, and 0,5 m white cotton for lining – both leftovers from previous projects. 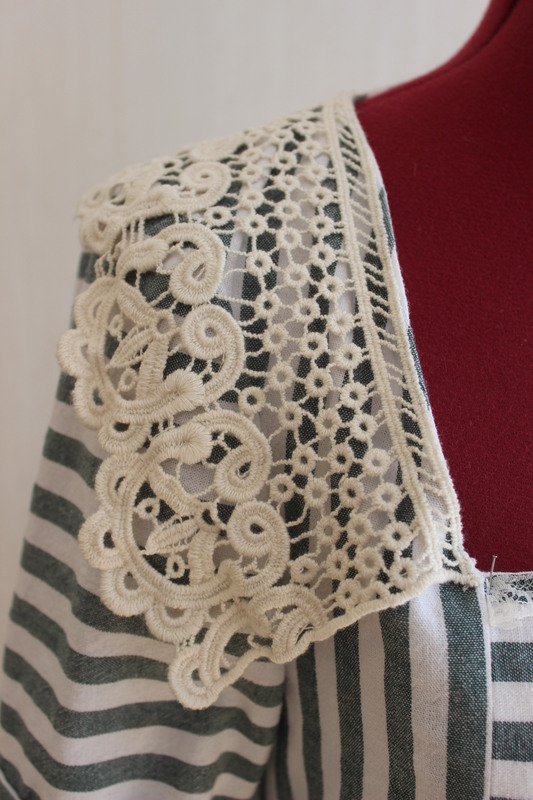 Notions: Thread, buttonhole tread, 6 buttons, 2 pairs of hooks and eyes, 6 snaps, 0,5 m of narrow lace, 1 m black velvet ribbon, one extra long lace/crocheted collar. How historical accurate: Not sure. I used modern techniques with lots of hand finishing. 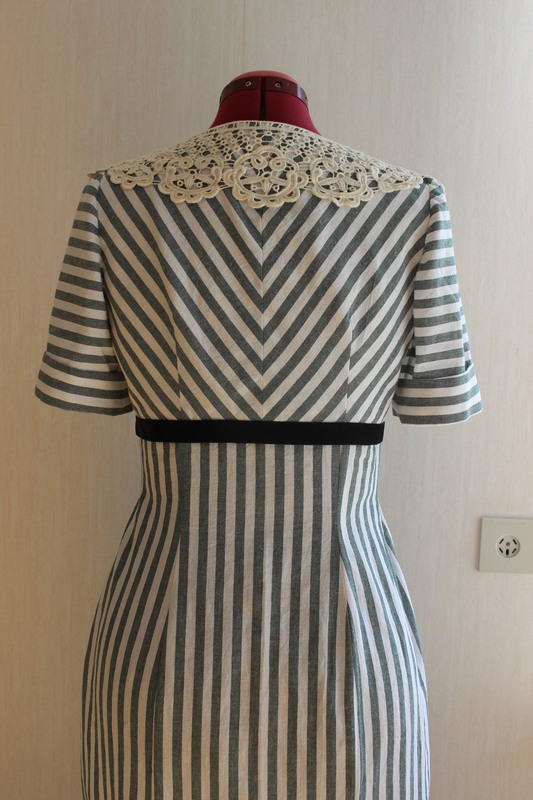 The fabric wold have existed in the period, but I think the slim silhouette are a bit to modern. Perhaps 5/10. Time: About 15-20 hours. 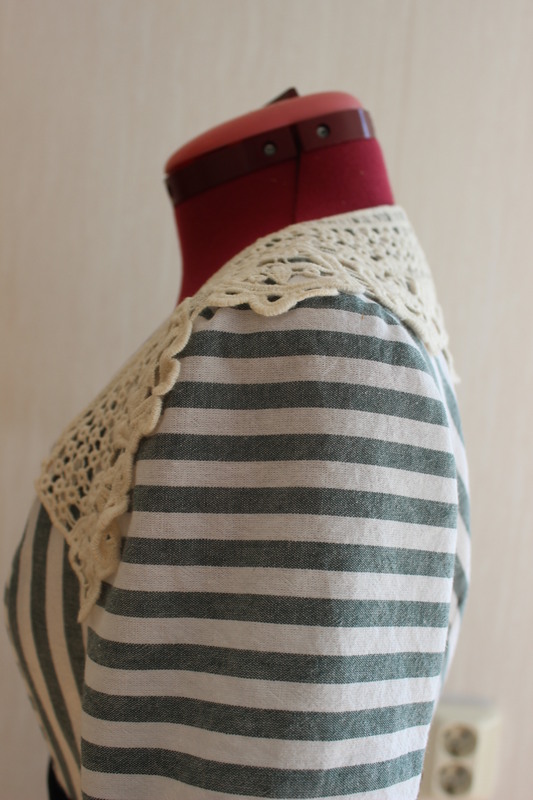 Lots of fiddling with both the fit and matching the stripes made this project a bit more time consuming then I expected. 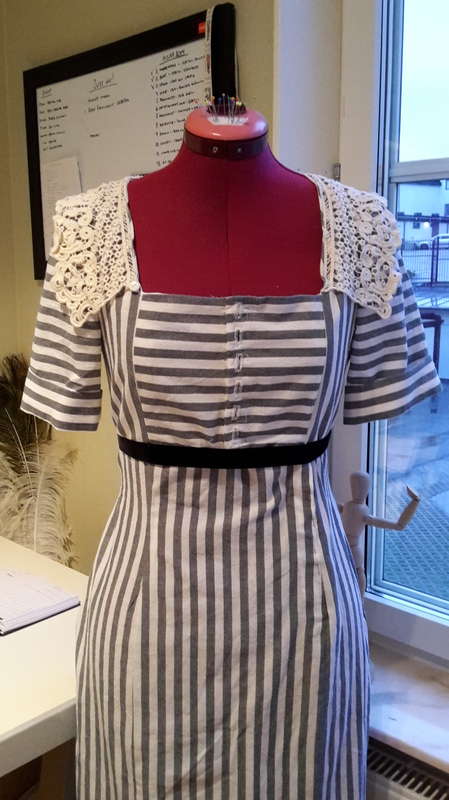 Cost: About 250 Sek (40Usd) all fabric from stash – Bought on sale a few years ago. First Worn: May 3 for photos. Final Thoughts: I really like this dress. 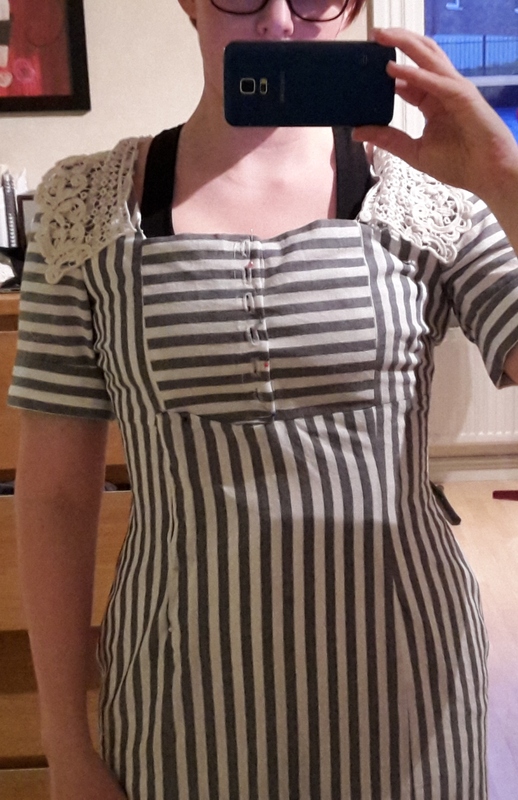 It came out exactly like I envisioned and I felt really pretty (and posh) in it. 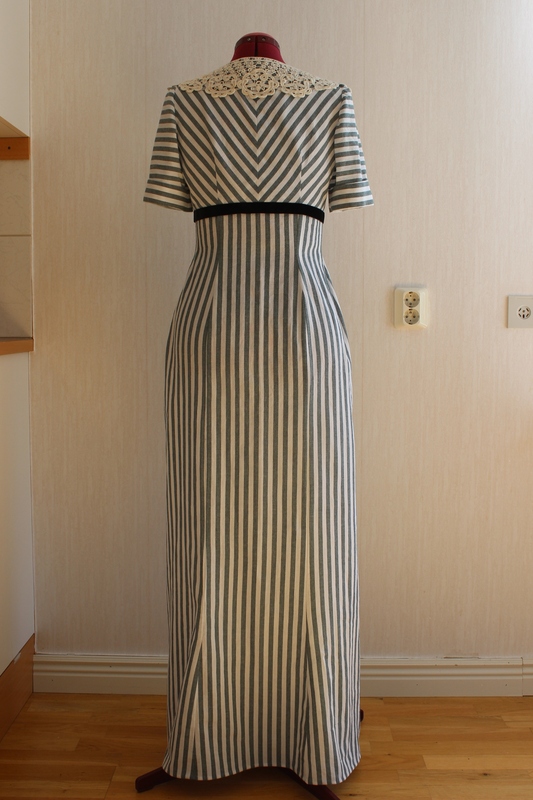 I’m really happy with the decision to make the dress slim and figure hugging (contrary to the original which have a more straight shape) even though it diverts a bit from the fashion of the day. 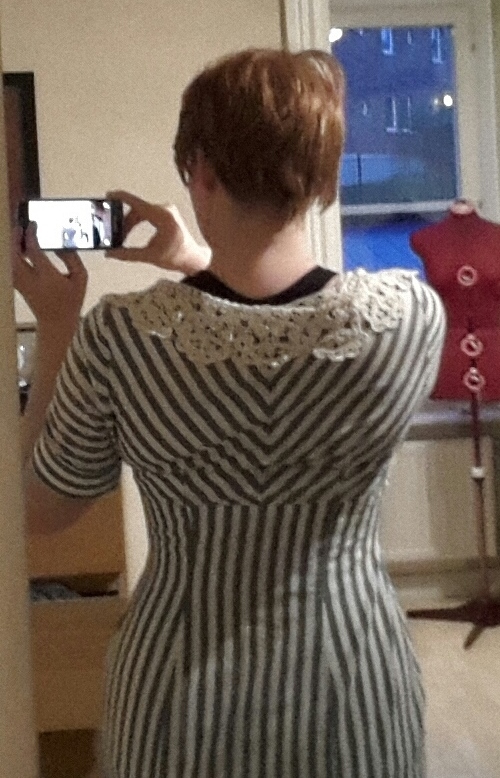 But there are as always a few thing I would like to fix before wearing it again: The back bodice are still to long (what’s that about?) 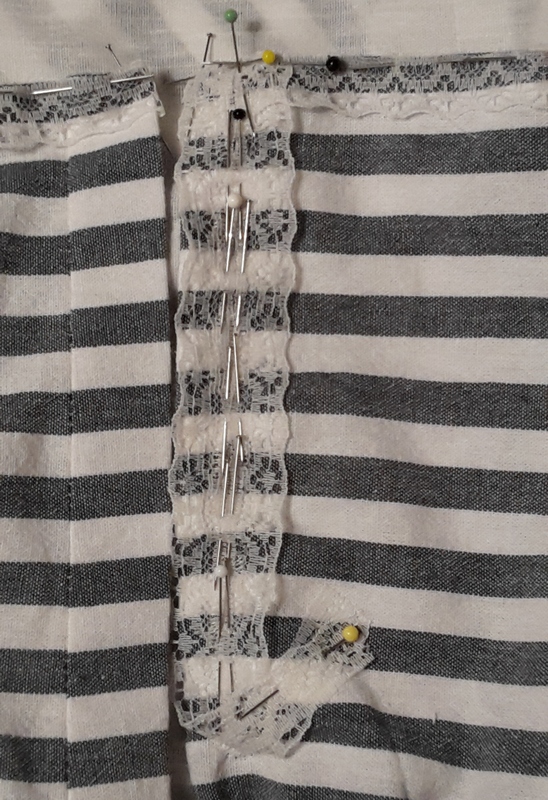 and the button holes need to be stitched shut about 2 mm each (those buttons needs to remain closed next time around). Accessorized and ready for a photoshoot. This looks great! Good for you! Ohh, so pretty and very close to the inspiration. 🙂 I love it. Well done.